Hehehe! This is so cute and adorable! I love the umbrella and that Sherlock and Mycroft initiate the kiss! OH my god so sweet! "Sir?" Donavan raised an eye brow and pointed to the tall man standing beside Greg. "Who's this?" Greg blinked, he hadn’t been getting enough sleep and he was feeling extremely tired. "Hmm?" He took a sip of the coffee in his hand and it seemed to waken his sleeping mind. "Oh, Donovan, this is Sherlock's older brother Mycroft Holmes. Mycroft, Sally Donovan"
Mycroft faked a smile; he could already tell the woman had the same idea about him as her idea of Sherlock. "What's he doing here?" Lestrade opened his mouth to speak but was quickly interrupted by Mycroft. "Government business Mrs. Donovan" He tabbed the front of his umbrella on the ground lightly. "I'll be gone before you know it, don't worry"
Sally rolled her eyes and left Lestrade's office. "Hmm… She doesn't seem to be fond of me"
Lestrade laughed. "No love, she's now not fond of the Holmes brothers"
Just Haven't Met You Yet! Ch2 “So your name is Sherlock?” The DI asked writing down some stuff in his pad of paper. Sherlock just nodded at him. He had just come out of the ER with a broken nose and a few bruised ribs but not much else. Much to his dismay, even if Lestrade had not came and picked him up, he wouldn't have died there in that alley. “Is there someone we can call for you..?” Lestrade questions hesitantly as if expecting him to say no. “The British government would probably work,” Sherlock said sarcastically. 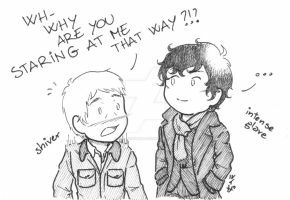 “W-what?” Lestrade asked confused. How did this man have any connection to the British government? He looked bloody homeless.